Pressure cook soybeans for 5-6 whistles, till it is done. Drain water and keep it aside. Pizza Sauce - Take and pan and heat oil. Add onions, garlic and saute it till it becomes translucent. Add tomatoes and remaining ingredients and cook it till it is done. Take a bowl. Add soybeans, paneer, salt, basil leaves(crush it with hands), black pepper, chaat masala,salt and mix it well. 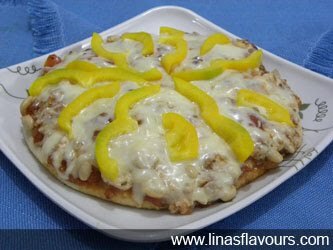 For Pizza - Take a base and spread pizza sauce, spread half of soybean paneer mixture and sprinkle half of cheese on it. Finally, top it up with julienne of yellow/red/green peppers. Bake it in a preheated oven for 20-22 minutes at 200 degrees C. till the base it crispy. Your pizza is ready to serve.